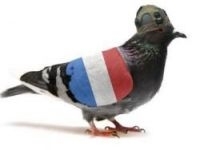 THE French army must breed more carrier pigeons, says an MP and pigeon fancier. MP for the Nord Jean-Pierre Decool, claims the Chinese army recently decided to recruit and train up 10,000 birds – whereas France has one solitary military pigeon, which lives at the Mont-Valérien fort near Paris. In practice the French army gave up using carrier pigeons after the First World War, however Mr Decool, who has 150 of his own, claims they would be ideal in a crisis situation, especially in the case of all telephone, radio and other electronic communications breaking down. Soldiers on missions in tribal zones in Afghanistan could be equipped with pigeons so as to communicate with their base, he added. Carrier pigeons are able to cover several hundred kilometres in a day to return to their loft. Mr Decool has put his idea to the Defence Minister, Jean-Yves le Drian, who reportedly told him he recognised the importance of carrier pigeons in military communications throughout history. He is now said to be pressing to have pigeons lofts installed near power stations “so they can keep communications going in case of an accident”. Syrian rebels are known to have recently made use of carrier pigeons.